Math is practically one of the hardest subjects there ever is and there ever will be, with geometry, calculus and algebra trying to join forces, it is very difficult indeed. 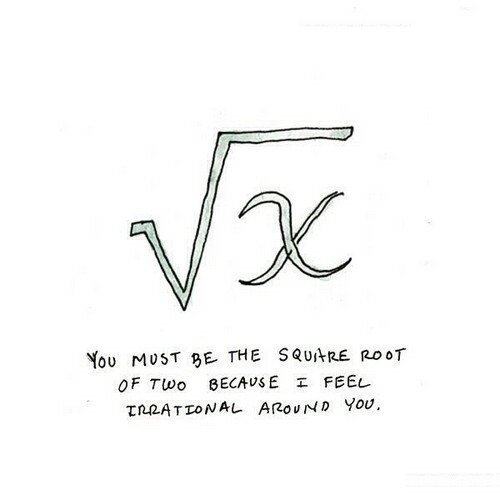 However, if you want to impress a girl or a guy at that matter, you can use Math pickup lines to show him or her that you are so knowledgeable of the subject that you are more than able to think of cute lines to tell him or her that you like how he or she is. Here are some math pickup lines that might be of some help to you. 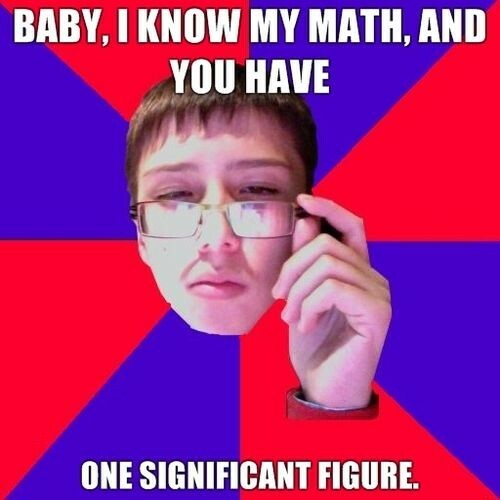 I’m actually really good at math and I have observed that you have a significant figure, girl. Should I be a cosine squared, you should be a sine squared and together we will become one. If you are going to ask me what type of angle are you, you will be my acute angle, baby girl. You can be the denominator and I will be the numerator and we can keep reducing our forms. I wonder if you are good at algebra as you are good with replacing my eX and not asking y. Some days it feels like our love is practically like pi, it keeps on going on and on forever. I wish I can be like problems in mathematics which you give a lot of your time just to answer. You are perfect with your vital statistics going from 36 to 25 to 36, all perfect squares, girl. My girlfriend right now is simply the square root of negative one because she is imaginary. I want you to know that I is less than three of you, it means that I love you so much more. I am not going to ever be obtuse with you as long as you keep being acute to me, my girl. You are Asian and that means that you must be good at all these numbers, what is yours? Let us use Fourier analysis on this relationship we have so we can reduce it into simpler one. I wonder if you want to squeeze this theorem of mine or at least try to see what good it is for. 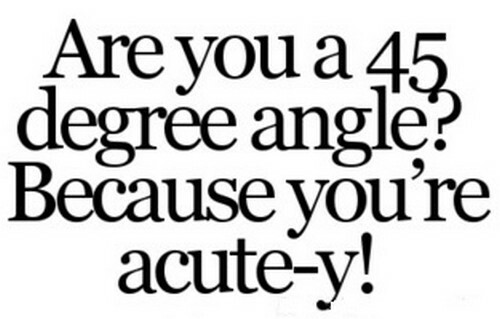 You must be an angle less than ninety degrees because no matter where I look you are acute! These feelings I have for you are the derivative of zero for they are totally constant, my dear. Want to visit my place tonight so I can show you how fast my natural log just keeps growing? You must be the answer to all my problems seeing you have look like a book, let me hug you. They say if you sleep with a book you will get smarter, you look like some book, can we sleep? Love is pretty much like math where you subtract clothes and pray not to even multiply. I think you must be a math teacher because you have me going harder than calculus ever is. I have heard from your friends that you like math, so what would be the sum of U plus Me? If I somehow form some sorting on your variables, I wonder if you could analyze what I did. You must be a forty five degree angle, girl because you are just so perfect right this moment. Should you be x squared then can I be x cube divided by three so I am under that curve? I wonder if I can just plug up this solution I have to your problem on your equation, girl. Let me bring you the wonders of numbers right now, I am very good in dealing with them. There are so many types of curves in calculus but baby yours is still my favorite of them all. There is a generalized volume for the cylinder but mine does not follow it, want to try it out? My love for you is such a square number because it is exponential and keeps on growing. Spend some time with me and I promise to give you more eureka moments than possible. Math makes me wish that I have you right here so I can cry on your shoulder all night long. I just have to tell you that I think you are well-defined, a function of time and other variables. I am definitely an engineer and if you want me to check out your heart, I can mend it for you. 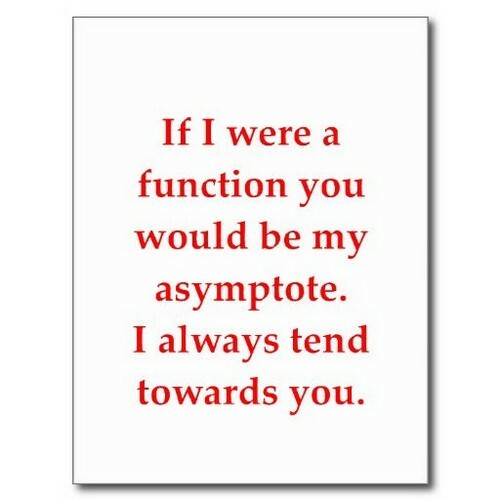 It seems you got an asymptote in that pocket of yours or maybe you are just happy seeing me. I am not really good at all those algebra stuff but I think you and I can do great things really. 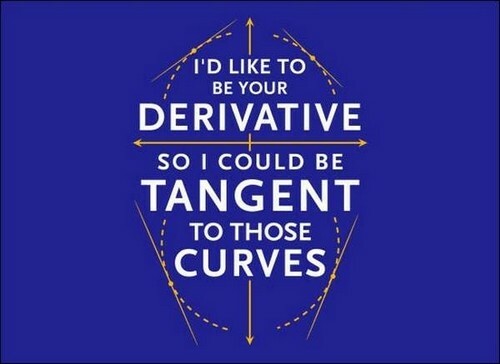 If I can be a derivative I would be a tangent so I can touch your curves even once in a while. Should we try how an imaginary and complex number would work out given a direction, girl? Baby if you let me I can find that nth term for you that you have been long looking about for. What is that under that radical sign you have, I want to check it out and see for myself. Math is really good because we can do the math and just stick around and be one together. In math, what you need is skills, nothing else and nothing more, that is why I like it, do you? If I like you and you like me, we can be together, would you care to do the math afterwards? You can derive me partially if you do not want the two of us to keep going all the way, dear. Should I ever become an integral what I can promise you, babe is that I will fill you up. You seem to have really nice legs, believe me on this for you are an isosceles triangle. If you are one of my classmates let me be a math book so you can solve my problems, girl. If ever I am about to spell your name in a calculator, would care to tell me that I rock? I would move the distance of my lips to yours in half and half and so on would they ever meet? I am going to prove wrong all the assumptions you have of me right now, I’ll start tonight. 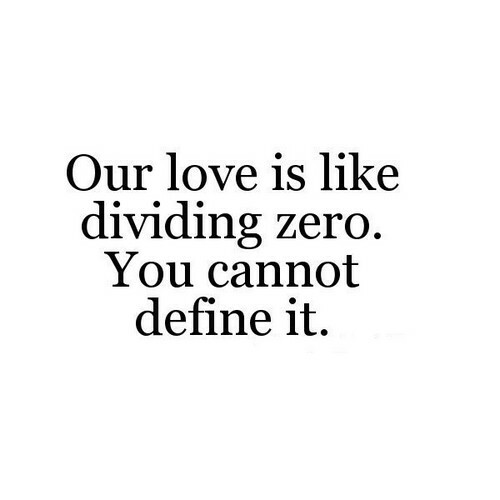 My love for you is what you get when you divide anything by zero, it is undefined, my dear. Like the infinity sign, I promise you that I will love you until forever lasts here in this world. The faster I keep on going I believe that I will last longer, I am relativistic in that sense, girl. Even at zero you would still get to move me because I am just so crazy for every touch, baby. If you need some help in your math, come to me, and I’ll show you to expand a polynomial. Do you even like math? Nope? Well, I do not either but I do care about your number, lady. I can assume what you’ve heard are my binomials expanding because you look so hot now. The way you reflect light in different angles just have so enchanted about you, my dear. I wish I can show you what I can do if you give me a ruler and a pencil and a room, love. You could be an asymptote because I keep finding myself being closer to you all day long. Maybe we should measure this friction between the two of us before it overheats too much. There is something about you that just makes me feel like I am in a confined space, girl. You make my heart beat faster like an airplane going 200 miles per hour, that you do. No matter how much you try to limit my interactions with you, I will still keep falling for you. I wonder what you’ve ever done to me that makes me go so crazy over you right this moment. You inspire me to be the best I can be and tell me that you love me being the geeky nerd I am. I can’t even imagine how large the vector magnitude is for me, would you normalize it now? Let me tell you that you are the most beautiful arc I have ever seen in my whole life, baby. Those theorems of algebra fascinate me but you amaze me even more than anything else, girl. If I can show you the circumference of the world, would you go back to what you’re doing? Your legs always seem to be divided in half I was wondering if you are nay good at math. Math gives people a lot of ideas like dividing their legs and taking you out of concentration. Math and your thing has something in common, they both drive me crazy right this moment. Let me be that math tutor you have long dreamt about, I will act that way for you today. Let’s cut the math class and just focus on what we can do to make you like me even more. Give me a chance to prove to you that I am really good at math though it doesn’t look like it. If I am your math assignment, I will be hard so that you will need to do me for a long time. 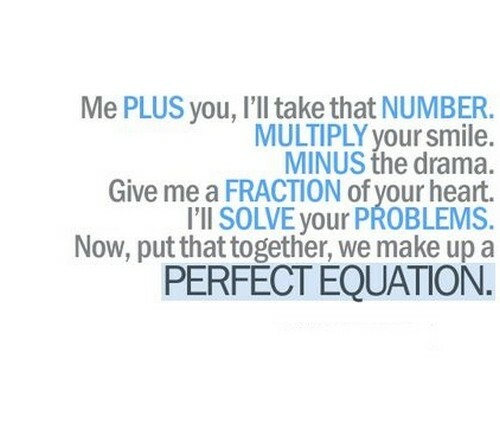 Math tends to get the best out of you but believe me that I will give you all that I have, baby. You and math have a lot of things in common, you both have me so distracted with life. You do the math and tell me about the things that make you yourself and make me myself. How about we try to work out some math as long as we do not get to multiply ourselves ever? Let us be careful with dealing with math as it is very hard indeed and a bit disposable. Math will help you to realize what you have right now is more than enough if you learn it. I want to intersect with lines and do the math that I need to watch for some time right now. If you want math, you need to understand that there are just moments you can’t solve them.